Joey is indeed a friend to Hello Kitty, and he isn't a kangaroo, but a small mouse. A very cute mouse at that. The polish My Pal Joey is a medium blue creme that is just perfect in every way. Perfect application. Perfect formula in just 2 coats. I really can't say anything bad about this one at all. To again refresh your memory of Hello Kitty's friends, we have Dear Daniel who is sort of Hello Kitty's boyfriend? 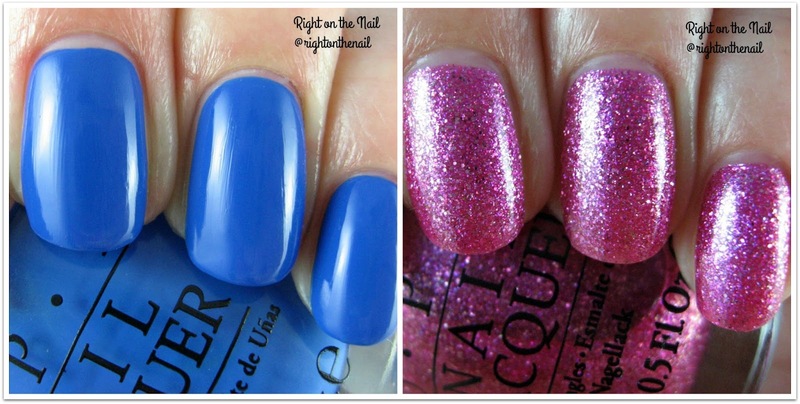 The polish is an intense pink glitter that is full-coverage in just 2 coats. It is quite glitter dense, so I don't think you can use it as topper unless you use one coat over a pink base. It's very girly and flashy at the same time. I'm happy to say this is pretty unique in my collection as well! OPI polishes retail for $10.00 and you can find them at your local Sally's Beauty Supply and Ulta stores. Find out more information about OPI on their Facebook, Instagram, and Twitter pages. I love this blog. May have to buy My pal Joey after seeing your swatch. Thanks for such a kind comment, Ashley! I haven't bought a ton of OPI polishes in the past couple years, but I'd easily recommend My Pay Joey.